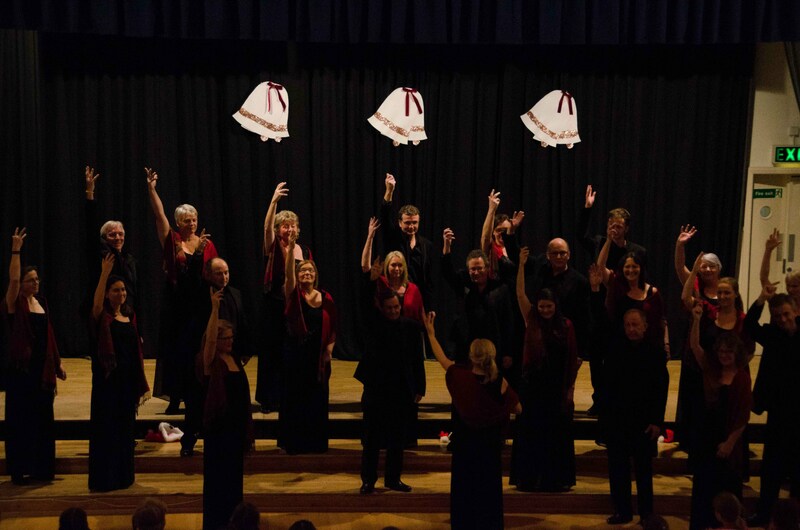 When we arrived at Cranleigh Village Hall for the Surrey Hills Singing School Christmas concert, we knew we were in for something special. There was a buzz in the air, and extra chairs were being added to accommodate an even bigger audience. The evening got off to a rousing start with all four choirs singing an arrangement of the late Leonard Cohen’s “Hallelujah”. Cohen is reputed to have written hundreds of different versions of the lyrics, and there are even more interpretations of what the words actually mean. However, one thing was for sure, it was wonderful to see the Young Voices and Training Choir giving it everything, and holding their own in the company of the experienced singers of the adult choirs. Next it was the turn of the children’s choirs together singing Hakuna Matata a song from the Lion King, featuring a dialogue with a flatulent warthog. 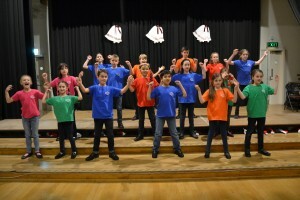 The upbeat and optimistic message from the children was ‘No worries for the rest of your days’. 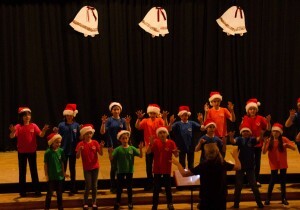 Then the training choir showed what they can do on their own with two songs ‘Hello’ and ‘Doo be Doo’ showcasing their expertise in changing pitches and rhythm. They sang it so well, that they gave a reprise, this time every child proudly taking a line as caller singing clearly into the microphone. 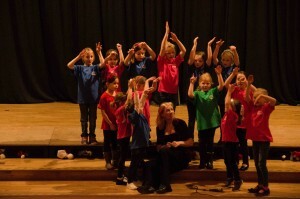 Every child delivered their line perfectly and it was a joy to see their confidence and delight in their achievement. They finished their set with a song they chose themselves, Chitty Chitty Bang Bang. The title describes the noise this magical, much loved, and much travelled car makes on starting up. They put their heart and soul into this musical and touching performance. Then a complete contrast as the Young Voices took us back to the playground for the song ‘Revolting Children’ from the musical ‘Matilda’ . They sang up to claim the right to be a little bit naughty, and to misspell words on the board. We had barely recovered from the shock, when we were whisked off to bonnie Scotland where were offered two songs for the price of one. In the first, with tongue twisting words, a Scots lad was coerced into marrying. Then we heard ‘Furrem be me heen’, an example of Gaelic mouth music which is sung music with a strong rhythm for dancing, for when no musical instruments are available. The real value for money came when both songs were expertly performed together in harmony and contrast. Then we were treated to an arrangement of ‘Somewhere only we know’, a wistful song evocative of memories of place, and of loss and yearning. The Young Voices ended their set by taking us into the sound world of spirituals, originally sung by black slaves on American cotton plantations. We started the journey on ‘This Train’ followed by ‘O When the Saints’ and moving on to ‘Swing Low Sweet Chariot’, finishing our journey with all three sung together in harmony. Then as a lovely surprise for us in the audience, Debbie, the conductor, then turned round and divided the audience up to join the sections of the Young Voices for another performance. The smiles on the faces of the children as the audience, including their mums and dads, joined in their song was a joy to behold. 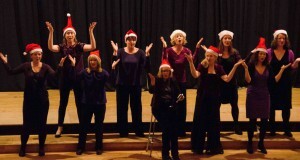 Then a complete change of mood from the Surrey Hill Singers. We were plunged into darkness for the atmospheric performance of Hotaru Koi, a traditional Japanese song about the firefly. In Japanese culture the firefly is a symbol of passionate love, and in rural areas the Japanese love to watch them dance above the waters on a hot summer’s night. 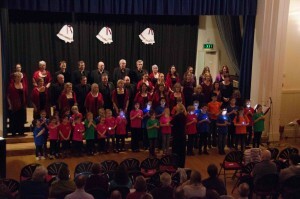 The Singers added an extra charm to their performance using torches to imitate the dancing fireflies. Then the ladies brought us back to Scotland for the Skye Boat Song, featuring the Jacobite uprising and Bonnie Prince Charlie (born to be King) . 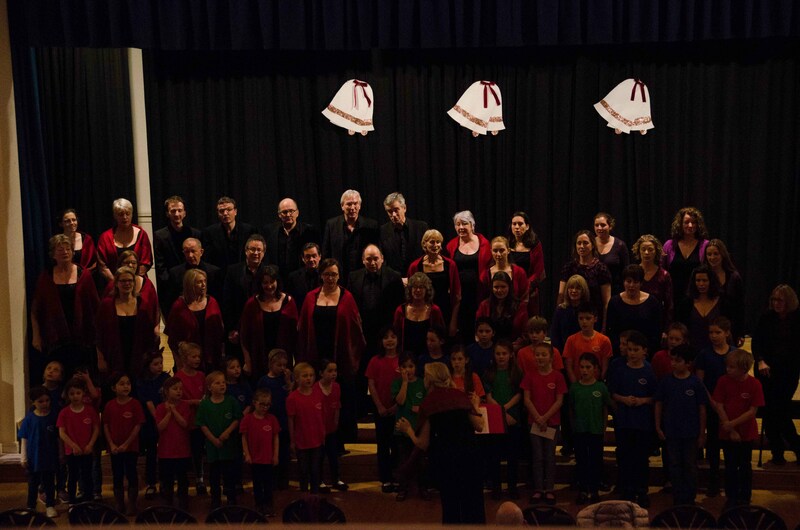 The performance started with unaccompanied solo then a gradual layered introduction of percussion and woodwind instruments and full choir. It was a mesmerizing performance. The ladies finished with a choral arrangement of Katy Perry’s ‘Roar’. Starting on a single voice part the character finds her inner voice and starts to roar like a ferocious ‘big cat’. In the audience we felt she had become the true champion of her own life. 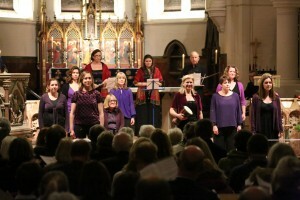 The first half closed with the Surrey Hills Chamber Choir performing four contrasting songs. The first, Hassler’s Verbum Caro a work with elements of Renaissance polyphony and Baroque traditions followed by Stanford’s Beati Quorum, which the choir performed with precision and elegance. Then an evocative 20th century piece by Ola Gjeilo, Ubi Caritas. 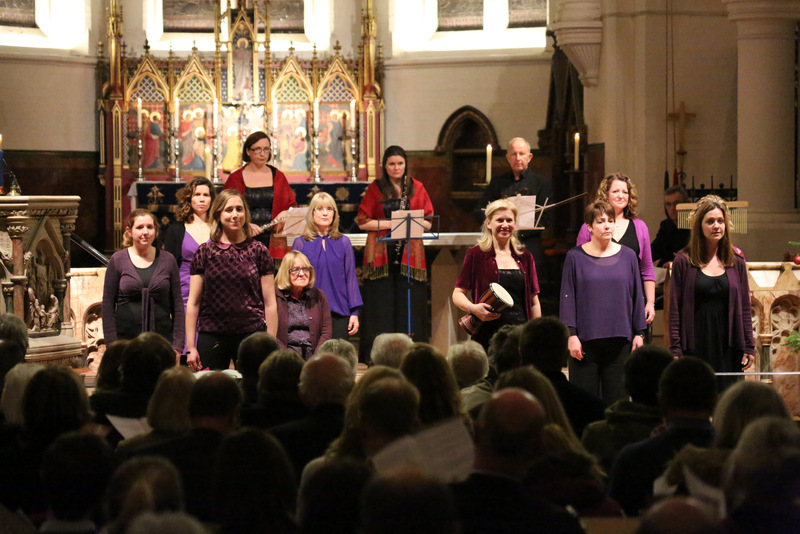 The meaning of the first line of this piece is ‘Where charity and love are, God is there’ and this motet was powerfully and deeply portrayed by the choir’s exceptionally moving performance. The choir ended their set with a dramatic secular piece by Californian composer Eric Whitacre. Set to a modern Spanish poem with elements of fire and water, and yearning for a lover who will be with him ‘until the universe can fit inside my heart’. This piece, ‘With a Lily in your Hand’, with its outpouring of emotion and passion made an invigorating end to the first half. The second half was devoted to Christmas music opening with Once in Royal David’s City, with the audience joining in verses 4&5. Then all the choirs in turn performed contrasting seasonal carols and songs, starting with a charming performance of Baby Jesus (sleep tight) by the Training Choir. The highlight of the Young Voices was ‘I Wish it Could be Christmas Every Day’ by ‘Wizard’, an outpouring of joy and excitement. The Surrey Hills ladies took us back in time for their opening carol the ‘Sans Day Carol'(The Holly and the Ivy) sug gesting an underlay of ancient pagan culture and yuletide celebration describing the birth, death and resurrection of Jesus through the prism of holly berries. 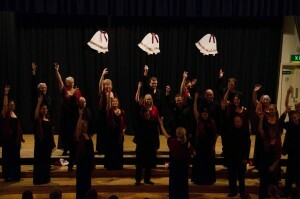 They finished their set with an upbeat jazzy rendition of ‘Here comes Santa Claus’, complete with Santa hats, which set the mood perfectly for the audience to join in the following carol with some lusty singing of ‘God Rest Ye Merry Gentlemen’. The Surrey Hills Chamber Choir treated us to the final set of the evening. ‘The Lamb’ by John Tavener, a gentle meditative work based on the poem by William Blake was beautifully sung giving us a few moments of reflection before an energetic and festive performance of ‘Up on the Housetop’, a celebration of children’s delight in the magic of Christmas. 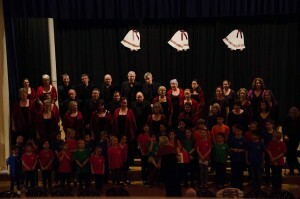 What a perfect end to a wonderful evening of music making and entertainment for all the family. The perfect start to Christmas.